A typical fiberglass boat is made up of a combination of materials including fibers, resins and core materials. Together, the composite materials work together to make up a low maintenance and durable boat. They are not indestructible however. 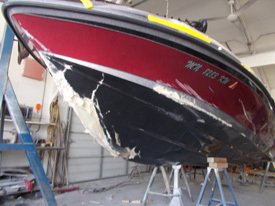 Fiberglass Boat Damages can be the result of several different factors such as collisions, storm damage, groundings, moisture intrusion and age. Anchor Marine Repair has a team of Boat Repair Experts in the Minneapolis/St. Paul, MN area. We provide our clients with Damaged Fiberglass Boat Repair Services that can get you back out on the water in a boat that you will be proud to call your own. The majority of Fiberglass Boat Damages are pretty cosmetic in nature. Scratches, scrapes and dings account for most of the damages requiring repair work. What appears as minor cracks and damages around a window, bulkhead or deck can actually be structural in nature. Only an experienced Fiberglass Boat Repair Experts can determine the underlying cause of the damage and provide a more permanent fix for the problem. 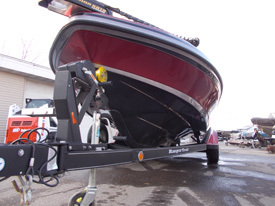 At Anchor Marine Repair, our boat repair technicians have seen just about everything when it comes to Minnesota boats. Out state-of-the-art facility is designed to tackle all types of fiberglass boat damages whether they are caused by a major collision, nature’s fury or age related factors. If you love your boat as much as the team at Anchor Marine Repair then you want only the best technicians to handle any Fiberglass Boat Repairs. Our team of boat repair experts can take a damaged boat and restore it to its former beauty or even better than before. Don’t hesitate to call if your fiberglass boat has been damaged due to grounding, collision, storms or age related fatigue. We got you covered.